So I read somewhere that you've got to make sure you blog at least once a week so everybody knows you're alive. I just want you all to know that I am working hard on my new book and am very much alive. Do you still have that origami bird and penguin I gave you? I thought this would be a good time to show them off! And how about this great drawing of Bernardo - complete with his hairy legs! @candygourlay Lovely! 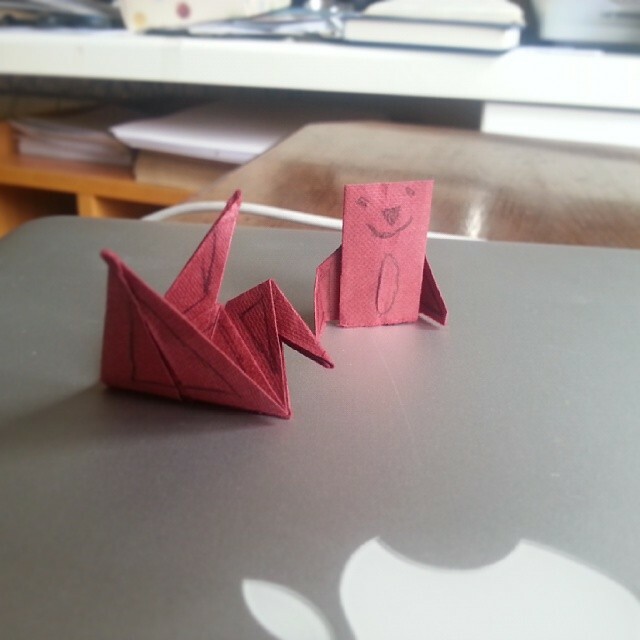 My small people are mad about Origami at the moment too! @candygourlay Very lovely! Lucky girl! Aww, thanks for dropping by! Hurrah! You guys were great! so were you! I have learnt good skills to make a good book. Aw shucks, thanks for dropping by! i heard that you are writing another book, what will you call that one?